Losan 25 tablet: Each film coated tablet contains Losartan Potassium USP 25 mg.
Losan 50 tablet: Each film coated tablet contains Losartan Potassium USP 50 mg.
Losan 100 tablet: Each film coated tablet contains Losartan Potassium USP 100 mg.
Losartan is indicated in the treatment of all grades of hypertension and heart failure. Moreover it is indicated in hypertensive patients with type II diabetes and delay the progression of renal diseases. Losartan is contraindicated in pregnancy and lactation. It is also contraindicated to patients who are hypersensitive to any component of this product. The usual starting and maintenance dose is 50 mg once daily for most patients. The maximal antihypertensive effect is attained 3-6 weeks after initiation of therapy. Some patients may receive an additional benefit by increasing the dose to 100 mg once daily. In patients who are salt depleted corrective measures should be used before starting Losartan and the initial dose should be reduced to 25 mg. No dosage adjustment is necessary for patients up to 75 years of age. There is limited clinical experience in older patients and a lower starting dose of 25 mg once daily is recommended. Losartan may be administered with other antihypertensive agents. Losartan may be administered with or without food. Use in elderly Patients: Patients up to 75 years: No initial dosage adjustment is necessary for this group of patients. Patients over 75 years: A lower starting dose of 25 mg once daily is recommended. In controlled clinical trials, in patients with essential hypertension, dizziness was the only side effect reported that occurred with an incidence greater than placebo in 1% or more of patients treated with Losartan. Rarely, rash was reported although the incidence in controlled clinical trials was less than placebo. Angioedema involving swelling of the face, lips and tongue has been reported rarely in patients treated with Losartan. Serious hypotension (particularly on initiating treatment in salt-depleted patients) or renal failure (mainly in patients with renal artery stenosis) may be encountered during Losartan treatment. In patients who are intravenously volume depleted (e.g. those treated with high dose diuretics), symptomatic hypertension may occur. These conditions should be corrected prior to the administration of Losartan or a low starting dose should be used. A lower dose should be considered for patients with a history of hepatic impairment. Losartan should be used with potassium sparing diuretics. No drug interaction of clinical significance has been identified. Compounds which have been studied in clinical pharmacokinetic trials include hydrochlorothiazide, digoxin, warfarin, cimetidine, ketoconazole and phenobarbital. 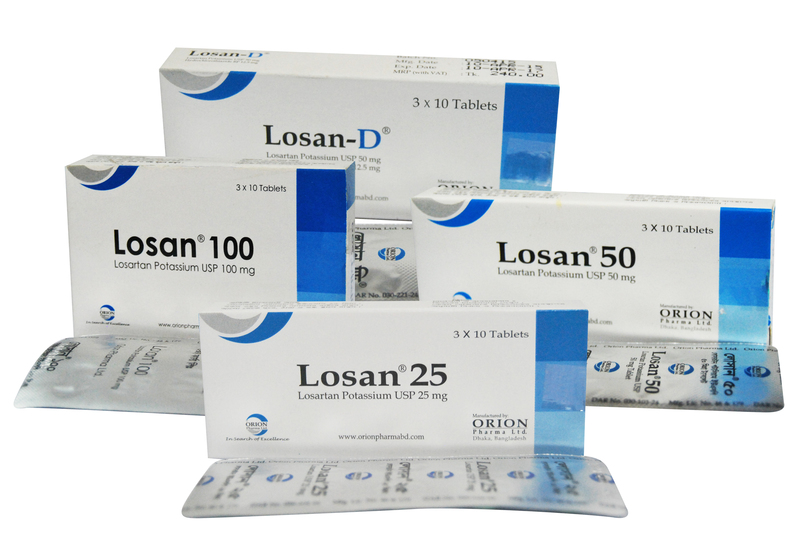 Losan 25 tablet	: Box containing 3x10 tablets in blister pack.